You couldn’t make this story up. If it hasn’t already arrived, you might soon be getting a copy of the Shropshire Conservative manifesto through your letterbox. Most of us would think that the banner photograph on the front page of the manifesto is of thirteen Tory activists or supporters. But look carefully. It took me a while to spot what is wrong with the photograph. Then it clicked. After that light bulb moment, it took me just minutes to discover that the image is not of Shropshire supporters at all. Not even of Tory supporters. The photograph has been lifted from an Australian mental health charity website. Something troubled me about the photograph when I first saw the manifesto. I just couldn’t place it but it didn’t look right. I could not get this out of mind, even though I couldn’t work out what was wrong with the image. After a long night writing, I ended up messing around online while I made up my mind whether to go to bed or walk the dog (the dog won!). It is often the case that a tired mind spots things that are hidden by an excess of concentration during the working day. Around 5am, I snapped back from dozing into action. The problem with the photograph is simple. It shows 13 people, 12 of whom are women. This is a political photograph. Unless you are illustrating a particular point or writing about a specific group, us political types try to aim for a gender balance in images. The banner photo on the Ludlow Conservatives website is a perfect example of this. My suspicions roused, I explored a high resolution copy of the manifesto photograph. In one woman’s hand is a can of Xero. As far as I can tell, we don’t sell that in the UK. There were other niggling points about the image too. The Tories are good at photographs and this seemed more like a snapshot of a volunteer group than a political photo of supporters or activists. It was time for a reverse image search. I have never tried this before but it proved both easy and informative. I uploaded a snapshot of the Shropshire Conservative manifesto. Goggle told me its source. The image proves to be a staff photo for the excellent mental health charity Grow. It’s based in Queensland. The photo, of Queensland and Tasmanian staff, was taken on 28 June 2013. I am really shocked by this. The first rule in an election period is that all literature must be honest. Putting aside any legalities, using a photograph for political purposes of a hard-working group of mental health staff in Queensland is a low trick. I cannot work out what was in the Conservatives’ minds when they decided to use this photograph. Even if a designer had used it unwisely, surely the leaders who signed off the manifesto would have noticed that the image was out of place? But evidently not. This about more than an image. It is about integrity. If the Conservatives head up their manifesto with a falsehood, how can anyone believe anything else the document contains? 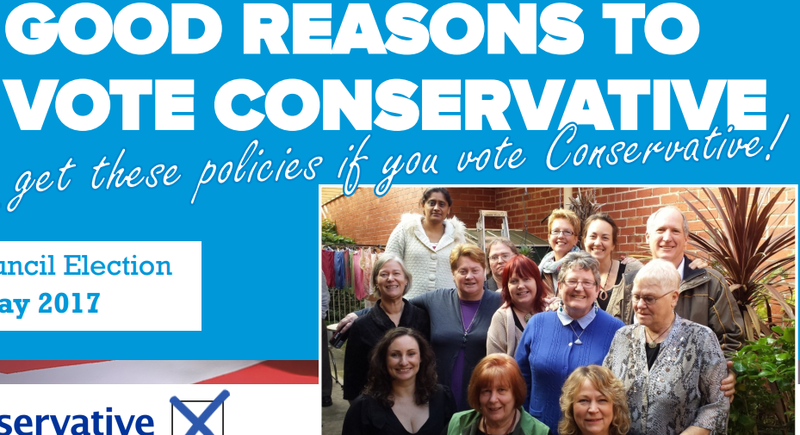 Shropshire Conservatives cannot continue to distribute this leaflet now that it has been found to feature a photograph lifted from the Internet. They should shred all remaining copies. The Conservatives should also apologise to Grow. They should make a donation to the charity in recompense for the unauthorised use of an image of its dedicated staff. And they should apologise to the people of Shropshire for a blatant disregard of the truth. Since this article was published, Shropshire Conservatives have withdrawn the printed and online versions of the manifesto. Obviously, only predominantly females and those living overseas vote Tory! Thank you to eagle-eyed Bodders. Speaking to our Much Wenlock Con Shropshire Councillor, David Turner, I expressed my concern that no action had been taken against Boris, Liam, David, et al for not coughing up the £350 million per week that they promised would be paid to the NHS during the referendum if Britain voted to Leave. With a look of pity at my lack of political sophistication, he informed me that “It is just politics, Malcolm”. I replied, “No, they were lies, and on both sides”. It seems that the Cons see lies as a bit of a laugh. It explains a lot about the morality behind most of their policies. Still, as a mere pleb, albeit with a Mensa certified IQ of 152, what do I know? That was certainly a good spot Andy. Shameful stupidity from the Conservatives. Probably a leaflet produced in China. If Pate knew about it he should resign. I hope they have to pay a handsom sum to the charity & the individuals in the photo for misappropriating the image. Well researched, Mr Boddington. I await with interest the Shropshire Star’s stated reason for not covering this on its front page, and the South Shropshire Journal’s decision to leave it out altogether. Am I suggesting these rags are biased? You bet your life I am. A conservative group mismanages the county’s finances so badly that we end up with over £100 million less than we should have and a further £20 million less EVERY YEAR, resulting in the wholesale closure of everything immediately after the election. And Star newspapers does a cringingly sycophantic piece on the lovable cuddly leader of the council with a twinkle in his eye as they finally get round to putting PV panels on the Shirehall roof seven years too late. Put this scandal to the nationals. If my picture was used in a Tory leaflet, implying that I’m a Tory supporter, I’d want to take them to court for defamation of character, making false claims about me, or whatever might stick. It’s despicable behaviour, even to the extent of being a libel. Well spotted Andy ! Why is this not front page in the Journal ?